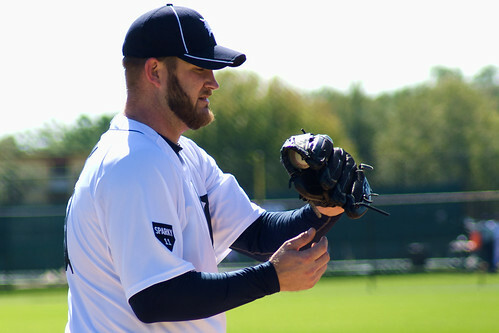 Tigers starter and notable Twitter presence Brad Penny usually sends a good-morning tweet every morning after he wakes up. On Wednesday, he greeted everyone with a different tweet. “Nice 8-mile bike ride to the stadium today,” he wrote. He confirmed it later: Before a day of workouts in Spring Training, he worked out by riding his bicycle to Tigertown, a 40-minute ride by his estimate. He enjoys the bicycle as a cross-training exercise some days, and Lakeland has made a point in recent years to become more bike-friendly with bicycle lanes on several main roads. He’s not the only one. Magglio Ordonez won’t commute to the park on his mountain bike, but he said he’ll ride a couple days a week, including near Joker Marchant Stadium along Lake Parker. It’s a good exercise for him, he said, and a good way to gather his thoughts. Thanks for noticing Brad. We’re also working on adding bike racks and improving our bike paths. Photo CC by Tom Hagerty for LakelandLocal.com. Used by permission.